You don’t have to be an ‘expert’ to be a conservationist or a hero for nature – time and passion are just as important. 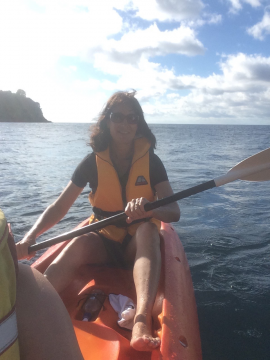 Donna Currey is one of 50 passionate people who put their hands up to be part of a campaign action group to help save the Hauraki Gulf. Here she talks about why she volunteered and the importance of nature. “I grew up in Diamond Harbour, which is a beautiful seaside village at the foot of Mt. Herbert overlooking the Lyttelton harbour (yes a Mainlander!) 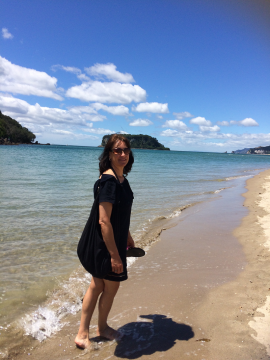 but I have lived in Auckland for 25 years now and the beaches of the Hauraki Gulf were the first ones that my children set foot onto. I am constantly inspired by the sheer beauty of the natural environment that surrounds us, from the incredible magic of a sunset, to the power of the ocean, the majesty of the mountains and the ceaseless cycle of life within it. I know that when I see trees being chopped down to make way for one project or another, I feel ‘not that great’, and when I hear stories of turtles dying because they’ve gone and mistaken a plastic bag for a jelly fish, I feel ‘not that great’. However, I’ve realised that every one of us can make a difference, in our own way. I believe people don’t have to be experts to be conservationists or change-makers. We can be the change – from signing a petition and using fabric shopping bags to volunteering in, and connecting with our community. We can all be heroes for nature, from right where we stand, and with what we’ve got. Then, taking our cue from nature, maybe we can leave behind a legacy that will not only inspire future generations but also ourselves. How have I seen the Hauraki Gulf change over the years? The main changes that I’ve noticed (relying on what my own eyes have seen above the water), is that there are a lot more people on the beaches now, it’s a lot more crowded. More people means more impacts on the wildlife in the Hauraki Gulf – from habitat loss, overfishing and pollution. Why did I join the campaign? Because nature endlessly gives, and I want to give back to nature. Nature supports our very life. From the air we breathe, to the water we drink and the earth we eat from. We are all deeply connected to nature. We are of it, and in it, and we will ultimately return to it. The wellbeing of nature is inextricably linked to our own well being, not only on a physical and economic level but also on an emotional level. What is my role in the Sea Change for the Hauraki Gulf campaign? I’m proud to be volunteering for the Sea Change campaign, where I’m Lead Coordinator for the Community Advocacy sub-group. My role includes gathering stories of the Gulf, reaching out to people who love the ocean and have seen for themselves the negative changes – our campaign gives them a platform for their voices.